The space plane would take off from an as-yet undetermined spaceport using two conventional jet engines. 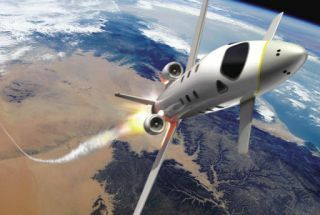 The plane would climb to 7.5 miles (12 km) in altitude before its rocket engine ignites, powering the vehicle through a coast phase that would provide passengers with one and one-half minutes of near-zero-gravity experience. PARIS ? Europe?sbiggest aerospace company, EADS, has concluded that carrying wealthy touriststo 100 kilometers in altitude for several minutes of weightlessness could be amultibillion-dollar industry in 20 years and is seeking co-investors to build arocket plane it already has designed. EADS?sAstrium division, prime contractor for Ariane 5 rockets and for Europe?scontribution to the international spacestation, said a group of its engineers has spent two years quietlydesigning a vehiclethat looks like a business jet with exceptionally long wings and a rocketengine powered by liquid methane and liquid oxygen. The company unveiled theproject here June 13. Taking offfrom an as-yet undetermined spaceport using two conventional jet engines, theplane would climb to 12 kilometers in altitude before its rocket engineignites, powering the vehicle through the atmosphere and into a coast phasewhose 100-kilometer apogee would provide passengers with one and one-halfminutes of near-zero-gravity experience. The roundtrip would last about 90 minutes. The plane would carry four passengers and apilot, with the passengers each paying about 200,000 euros ($267,000) for theexperience. AstriumPresident Francois Auque said one side benefit of the project is to shatter theclich? that established aerospace giants like EADS have lost their imaginationand sense of daring. Auque saidAstrium and EADS have investigated the business model in recent months andconcluded that their project has sufficient advantages compared to similar efforts under way bystart-up companies in the United States to attract as many as 4,500 payingcustomers per year by 2020. At $267,000per ticket, that customer volume would generate gross revenues of some $1.2billion per year. Auque saidthe company has determined that designing and flight-qualifying its proposedspace plane would require 1 billion euros in investment. He said Astrium hasbegun hunting for co-investors and would give itself until the end of this yearto round up the needed commitments before abandoning the project. AstriumChief Technical Officer Robert Laine, who leads the Astrium team working on theidea, declined to say how much of its own resources the company would bewilling to invest alongside its co-investors. ?We will make our business planavailable to co-investors only,? Laine said. Laine saidproject officials envision building five initial vehicles, with the planescapable of being refurbished quickly enough to fly once per week. He saidAstrium has surveyed other space-tourismprojects, mainly in the United States, and found most of them lacking inengineering or business-model seriousness. ?There are those who think you candesign a rocket plane in a garage,? Laine said. ?Suffice it to say that that isnot our niche.? Auque saidAstrium and its parent company have enough experience in designing Airbusaircraft and rockets to be confident in their ability to design a craft thatmeets the stringent safety and operating-cost constraints of a space-tourism business. ?The bigpart for us will be finding private finance partners. If we succeed, we willopen the door to private financing of space.? Wide Range of Rocket Tech for Civilian Spaceflight ?